The first modernized Tu-22M3M bomber is set to roll out and start ground testing in August. 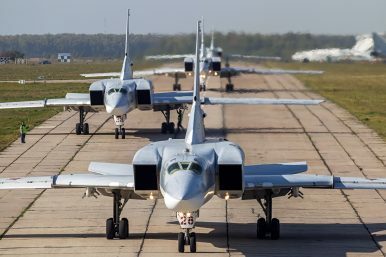 The first prototype of Russia’s upgraded Tupolev Tu-22M3M long-range strategic and maritime strike bomber will be rolled out on August 16 with ground testing to begin shortly thereafter, according to Russian aerospace and defense company Tupolev. Furthermore, the head of Tupolev, Alexander Konyukhov, recently told Interfax news agency that the maiden flight of the upgraded Tu-22M3M is scheduled to take place in the third quarter of 2018. The first upgraded bomber is expected to be delivered to the Russian Air Force this October. The Tu-22 M3M is a supersonic variable-sweep wing bomber first introduced into service with the Soviet Air Force and Soviet Naval Aviation in the 1970s. Around 60 Tu-22M3M are currently in service with the Russian Air Force, about half of which remain permanently grounded and are not flightworthy. The Russian Ministry of Defense intends to upgrade up to 30 Tu-22s to the more advanced Tu-22M3M variant. Aircraft upgrades will include modern avionics, digital radio-navigation equipment, a new communications suite, and a new updated weapon control system to give the aircraft the capability to launch precision-guided air-to-surface weapons including air-launched ballistic missiles and long-range anti-ship missiles. The KH-32, an upgraded version of the Raguda Kh-22 long-range anti-ship missile, has been specifically designed to attack U.S. Navy carrier strike groups, but can also be used for land strike missions. It is reportedly designed to climb to the stratosphere (40 kilometers) after launch and then either directly dives at the target or executes a lighter dive and approaches the target flying close to the ground at around 150-200 meters. The K-32 purportedly has an operational range of 1,000 kilometers and can reach top speeds of over Mach 4 in its terminal phase. The Tu-22M3M can also carry the Rhaduga Kh-15 aero-ballistic missile. The bomber will be capable of carrying up to three KH-32 or 12 Kh-15 missiles. Both the Kh-15 and KH-32 can alternatively be fitted with conventional or nuclear warheads. Overall, the bomber can carry a weapons load of around 24 tons. Next to missiles, the aircraft is also armed with a double-barreled GSH-23 (23-millimeter) gun fitted in remotely controlled tail turret. Part of the Tu-22M3M avionics suite will be similar to that of the Tupolev Tu-160M2 long-range supersonic strategic bomber, according to Russian military sources. Notably, unlike, the Tu-160M2, the Tu-22M3M is not expected to receive a new engine and will continue to fly with its two Kuznetsov NK-25 turbofan engines. With a cruising speed of 900 kilometers per hour, the operational range of the aircraft is around 7,000 kilometers without refueling. The first flight of the Tu-22M3M bomber took place on December 28.